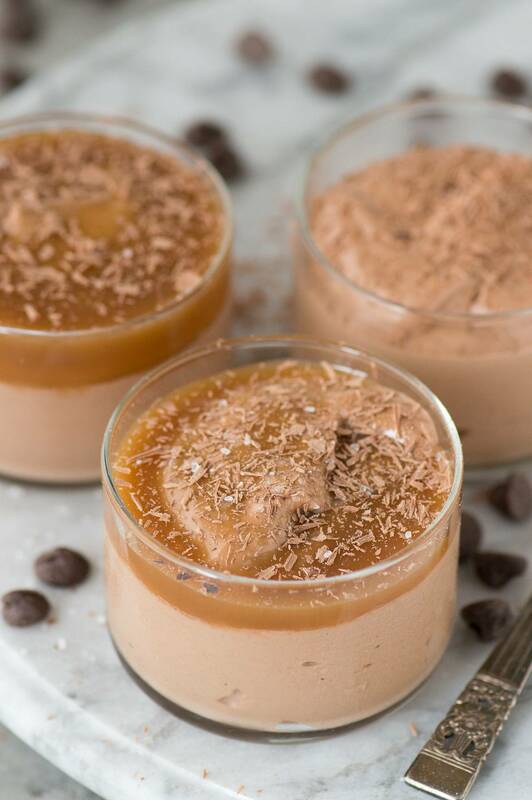 Learn how to make 3 ingredient mousse using any flavor of coffee creamer! The flavored creamer gives the mouse AMAZING flavor! 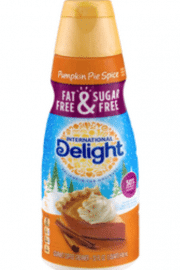 I’m so glad I live in the era of flavored coffee creamer. Is that lame to say?! I’m sure that there are a whole bunch of you that agree with me! The recipe I’m sharing today is something that’s been in my bag of tricks for a while. I used the same method in this chocolate peppermint mousse recipe. 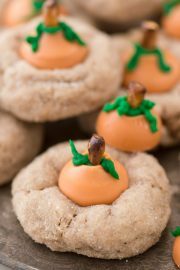 I’ll be making that recipe again this holiday season! 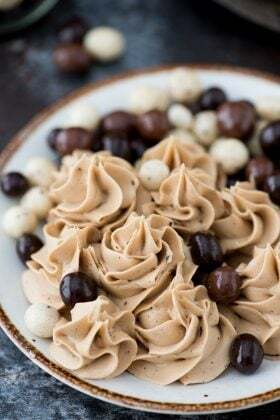 I wanted to show you guys how you can use any flavor coffee creamer to make 3 ingredient mousse! 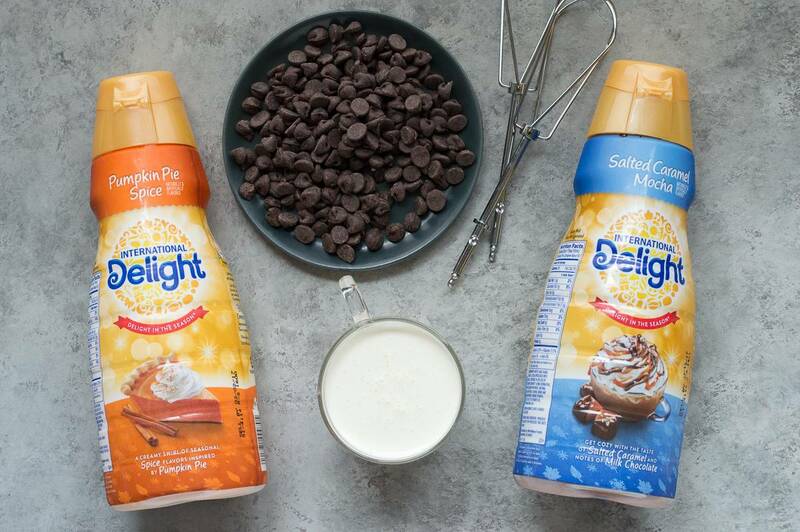 You’ll need chocolate chips (milk, dark, or white), heavy cream, and then your choice of coffee creamer. Here’s a 25 second video showing you how to make mousse! Side note: You’re wondering if this step is necessary. I have made mousse and whipped cream by sort of chilling the bowl ahead of time.. meaning last minute I stick it in the freezer or I pull it out of the freezer too early and by the time I actually whip the cream, the bowl isn’t chilled anymore. Here’s what I’ve observed – chilling the bowl and beaters ahead of time produces mousse and whipped cream that has stiffer peaks (that’s a fancy way of saying it’s more stable). 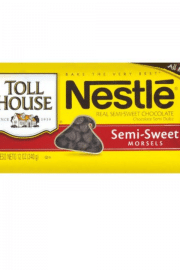 I do recommend chilling these items ahead of time, but if you completely forget, putting them in the freezer for at least 5 minutes is better than nothing. 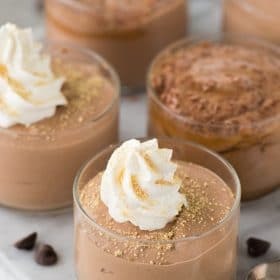 I used International Delight Pumpkin Pie Spice creamer in one batch of mousse and International Delight Salted Caramel Mocha Fudge creamer in a second batch of mousse. 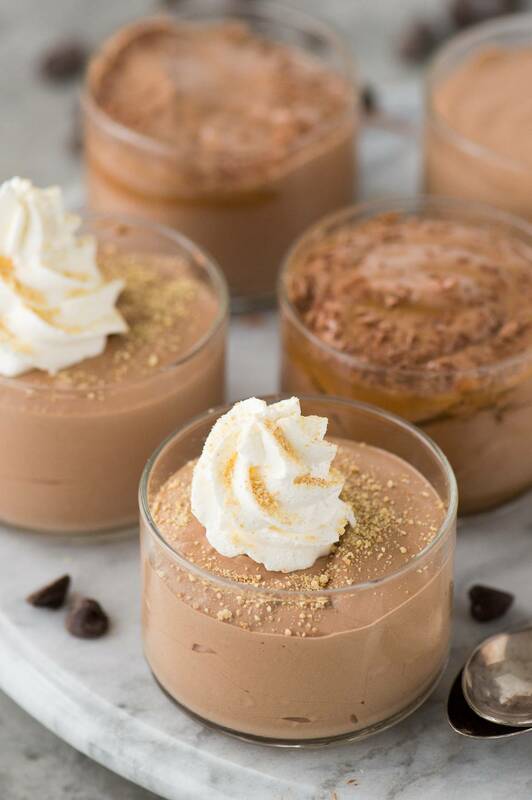 I topped the pumpkin mousse with a dollop of whipped cream and graham cracker crumbs and topped the salted caramel mousse with caramel sauce, sea salt and chocolate shavings. They were both amazing and had great flavor! 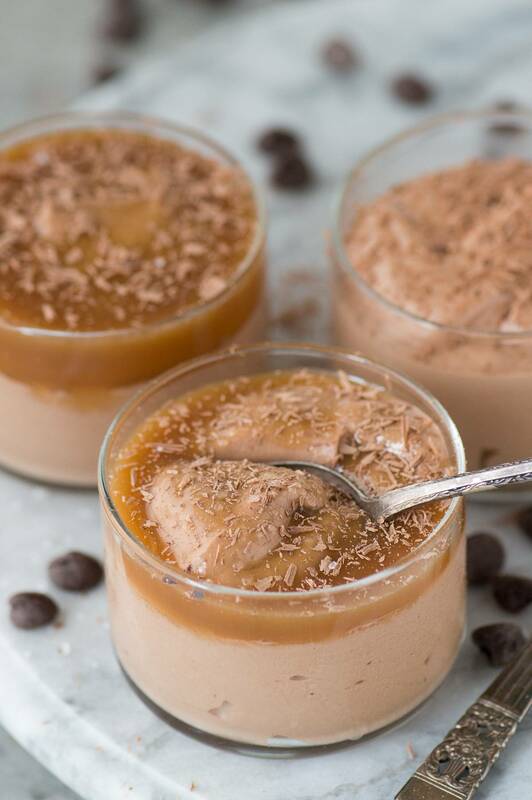 Learn how to make 3 ingredient mousse using any flavor of coffee creamer! 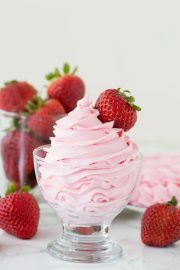 The flavored creamer gives the mousse AMAZING flavor! Remove the chilled mixing bowl and beaters from the freezer. Add the coffee creamer and heavy cream, beat for 5 minutes until soft peaks form. 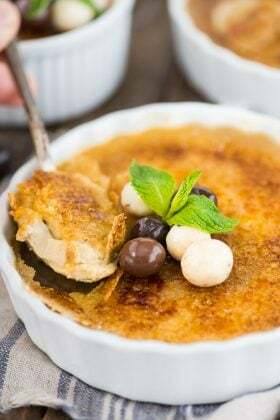 This is an absolutely fabulous dessert! So simple yet tastes so good! 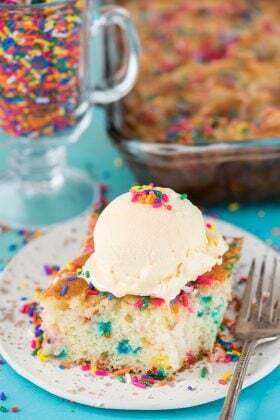 I served this to guests at a party – everyone loved it & were impressed! I didn’t share how easy it is :) The only thing I have trouble with is getting my chocolate to blend in & not be lumpy. I have made it 3 times & I followed the directions to allow chocolate to come to room temp before adding to mixture. Am I doing something wrong? 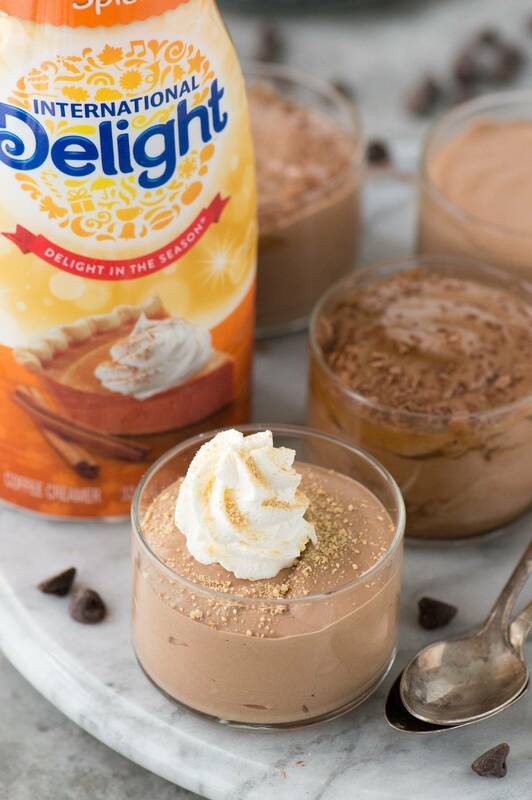 The mousse can be refrigerated – so definitely a day a head of time. Did this as a filling. I made a chocolate cookie crust in a spring form pan. 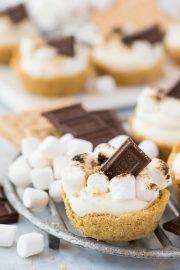 I filled it with this recipe and topped it with whipped cream, hard shell chocolate drizzle and zested dark chocolate. It’s been the hit of my dinner with company four times. 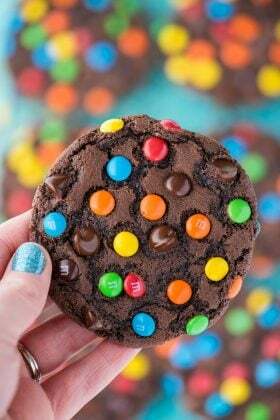 Can’t go wrong with this desert!